The parking lot and streets surrounding Highland Park in northeast Grand Rapids are bumper to bumper on an overcast autumn morning on the third of October. Half a dozen tents are set up nearby to cover the grills full of burgers and brats for tailgating, and cowbell wielding fans are wildly cheering as their favorite helmeted and brightly colored athletes rush past. While the scene described could be a local football game it isn't. 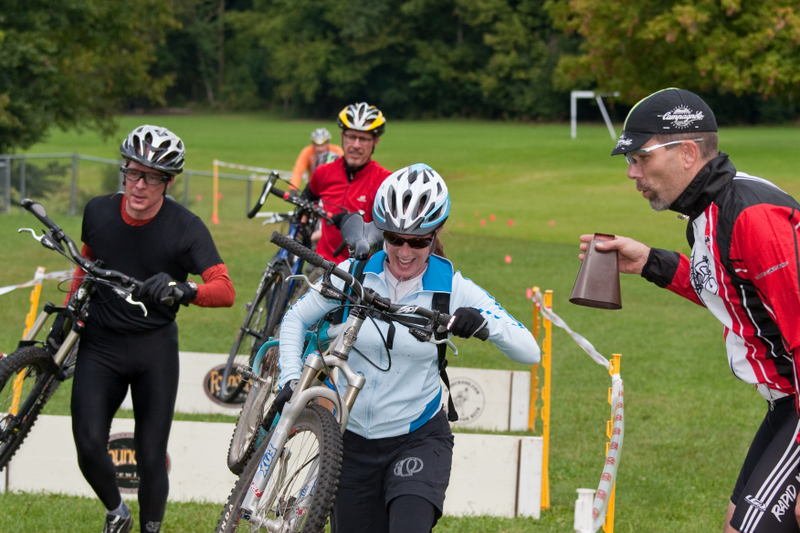 Instead it's a cyclocross race, a discipline of cycling that is growing in popularity across the U.S. and especially in West Michigan. Historically, cyclocross began as a way for cyclists in Europe to maintain fitness through the winter months. Over time, it has become a distinct and colorful subculture of cycling embraced the world over. The largest hotbed of cyclocross is in Belgium. Not far behind are other European countries and most recently, America, which is enjoying a groundswell of interest as well. In Belgium, whole weekends are devoted to series of races. Fan clubs for riders and teams display fanaticism equal to—and sometimes surpassing—American support for our sporting pastimes. Add in the wide variety of Belgian beer and a cyclocross race turns into a enormous running party that overtakes whole towns and villages as spectators and fans descend to take in a race and cheer for their heroes. 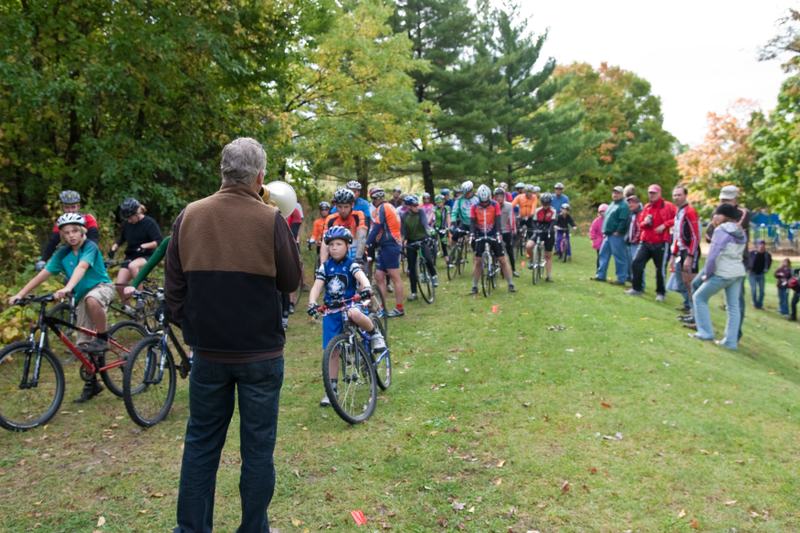 Cyclocross races were originally run as point-to-point straight line races crossing over whatever obstacles happened to be in the way. 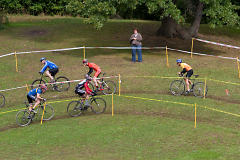 As spectating grew, modern cyclocross courses began to follow a closed circuit and make use of natural and man-made obstacles such as hills, sandpits and offroad trails to challenge the riders. Additional man-made barriers can be used so that riders must carry their bikes and run short sections. Typically 1.5 to 2.5 km in length, the routes are usually twisty, tight loops that seek out all the hard parts of the terrain and allow spectators to see much, if not all, of the action from a few key points. 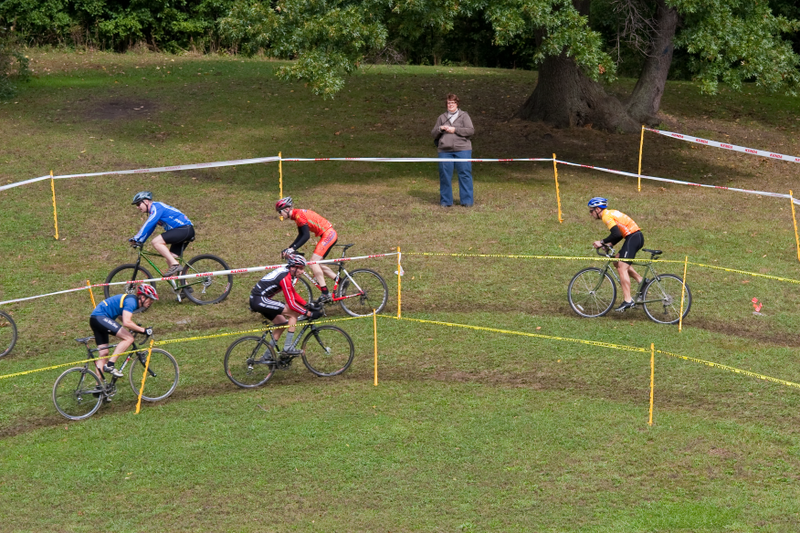 Here in Grand Rapids, cyclocross has followed that same style of racing in local parks throughout the area. When asked to describe cyclocross, KissCross founder and race director Rick Plite was quick with an answer. "It's the steeplechase of cycling. " said Rick, "By steeplechase ... people think of horses running over barriers, streams and poles, jumping haybales, hills and turns. That's what cyclocross is. It's kind of a combination of mountain biking and road cycling with some running thrown into it." After starting Kisscross in 2002 with a single race for about 30 cyclists, founder and race director Rick Plite has grown the event into a series of seven races running from September through November. Attendance now averages 120 cyclists and each race day holds three separate races (A,B and C) with scoring for multiple categories within each race. Despite the robust growth Rick has kept the events intentionally grassroots, fun and low tech. "Frankly, I've had numerous people try to score it through the years" Plite said. "But you just can't keep track of everybody's lap." And so, in the honor of the mantra "keep it simple, stupid," KissCross races are self-scored on the honor system with riders sliding their name tag onto a spindle after riding and counting their own laps. Prizes at KissCross also differ greatly from other races for two reasons. Winning the race doesn't mean you'll get a prize, and if you do win a prize it probably won't be money. KissCross touts the slogan, "Racing for beer," and with Founders Brewery as a lead sponsor, six-packs of local brews are assigned at random to different places in each race. "We used to give first place a six-pack of beer all the time, but we decided that wasn't fair because the same guys kept getting the beer," said Plite. "Now, it's random. We attach a sticker on the prizes and if you came in 10th you might get something if you came in last you might get something. It's a fun way to do it." Indeed it is fun, as evidenced by the 140 or so cyclists that came out on a rainy Saturday morning to compete. 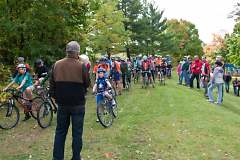 There were cyclists of all ages from 8 to over 50 riding bikes of all types and enjoying a past time that is part of cycling tradition. There are a growing number of women participating, too. "Women's is growing all the time. The first few years there were zero women, maybe one," Plite said. "We've got maybe 10 in each class now other than the A's." 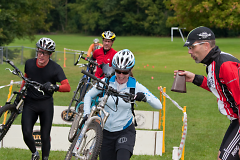 From semi-pros down to first timers, KissCross invites everyone and provides a great cyclocross racing experience in West Michigan for a low $20 entry fee, and that is what Rick Plite is striving for. "My buddies and I said, 'you know, we could put on a grassroots an event and just do it ourselves.'" Rick explained. "It's just kind of evolved and morphed through the years and gotten bigger and a little bit more serious, but it's still laid back, grassroots and affordable." Judging by the growing fields of riders and the numbers of supporters he's right; keeping it simple is a formula for success. 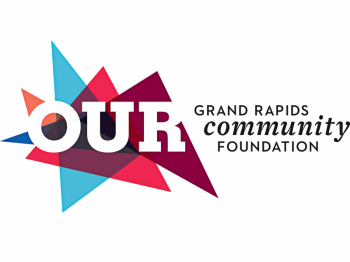 For more information, visit http://www.kisscross.com or come out and watch the next race at Manhattan Park in East Grand Rapids on Nov. 15th starting at 11 a.m.